The greatest reward of working with kids is seeing how dramatically they report their improvements. The boy just mentioned, that we are working with, had some coordination and balance issues, along with his other ADHD symptoms. As we worked with him to improve his overall health through chiropractic, nutrition and neurosensory integration, his mom noticed improved coordination. Where he would have avoided playing catch with his brother in the past, he joined in with his brother and the neighborhood kids this spring. One day he mentioned to me that he hadn’t rode his bike in several years because it was tough for him so it wasn’t fun. Since he was doing other things better, he wondered if he might be able to ride his bike this year. I told him to give it a try, knowing from his progress he would do well. 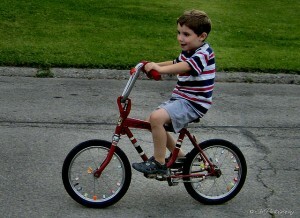 The next time he was in, he was bounding with excitement that he rode his bike! Does he/she have problems with balance? Does he/she get motion sickness? Does he/she avoid closed eye activities? Does he/she have a hard time listening for long periods without moving or rocking? Does he/she have difficulty with math or reading or writing cursive? Learn more in the Children and Learning section of our site.